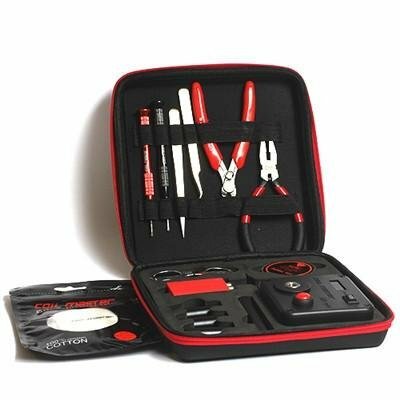 The Coil Master DIY Full Kit V3 positions itself as the most fully loaded kit available today, now including an the updated Coil Master 521 Tab Mini and triple sided T tool, while also including a six size micro coiler with coiling rods, foldable scissors, a ceramic tweezer, a bent nosed tweezer, precision screw drivers, precision pliers, a spring loaded flush cutter, 24 gauge Kanthal and organic cotton. Unprecedented in not only offering a full suite of tools, each tool is specifically designed and manufactured towards the day to day usage pertaining to coil rebuilding, coil maintenance, and general vape care. The Coil Master micro coiler offers six sizes from 1.5mm to 4.0mm in increments of 0.5mm, giving users a huge array of coiling options. Bent Nosed Pliers and Ceramic tweezers are utilized in tandem to both do fine adjustments and contact coil setting, respectively. Two precision drivers in flathead and Phillips configuration are able to handle just about any type of screw adjustment, while the needle nosed serrated pliers has both the strength and precision to make coil bending and general adjustment easy and exact. Two cutting tools are also included, with foldable scissors allowing for a compact way to shear and cut wicking material and the flush cutters giving the user clean and precise wire cuts. The Coil Master 521 Tab Mini is driven by a single 18650 battery (sold separately) that features a hundredth decimal accurate readout while also test firing down to 0.1 ohms . With the inclusion of a 10 foot spool of 24G Kanthal A1 and a compact bag of organic cotton, the Coil Master DIY Full Kit V3 offers the user practically every tool required in day to day building and maintenance in a compact case.